Added chord tones or “extensions” are the building blocks of jazz harmony. When you extend a basic chord structure one note at a time, hip jazz sonorities will most certainly spring forth. Let’s look at how adding just one note can change the aural impact of a chord. Click denser images to enlarge. Ex. 1 starts with adding one note to a minor triad: the sixth. On top of a minor triad, the sixth is all you need to get a “film noir” type of sound. Try creating a different inversion by moving the top note down an octave. Now check out the major sixth. It’s got a vibe all its own. Ex. 2 shows another potent chord extension. Adding a ninth on top of a minor seventh chord creates a minor ninth. Stacked thirds give this chord a calm yet dark quality. You can make your voicing more “jazzy” by moving the root down to the left hand and the top two notes down an octave. Move your thumb down to the sixth (A) to create the always alluring minor 6-9 chord. The major seventh chord has a classic sound all its own. Stack the ninth (Bb) on top to create stacked thirds, then move the ninth down an octave, as seen in Ex. 3a. The low Bb and C give this chord its weight. If you move your left hand down to F, you create an Fmin11 chord and the landscape immediately changes. Changing just one bass note, (much like adding a chord extension itself) can open up many creative possibilities. Ex. 3b shows an arpeggiated line using these same voicings. Dominant seventh chords love added notes, especially altered extensions like the flatted ninth and sharp ninth, seen in Ex. 4. Put them both in the same voicing and your chords will soar! Added chord tones “resolve” in various ways, often downward. In Ex. 5, when moving from D9 to G9, the fifth becomes the ninth, and the third moves down to the seventh. If you add an E to the G9, you get a G13 chord. Now move the seventh (F) down an octave, and you get a “meat and potatoes” jazz voicing. Ex. 5b uses these new extensions in a progression of D13 and G13. I’m using three-note gospel voicings for a sparse, bluesy sound. In Ex. 6 we dig even deeper. Add a ninth to a major seventh chord to get the major ninth, then add the sharp 11th (G#). Note how it’s just another tone in a series of stacked thirds. Now add the B (the 13th) on top. 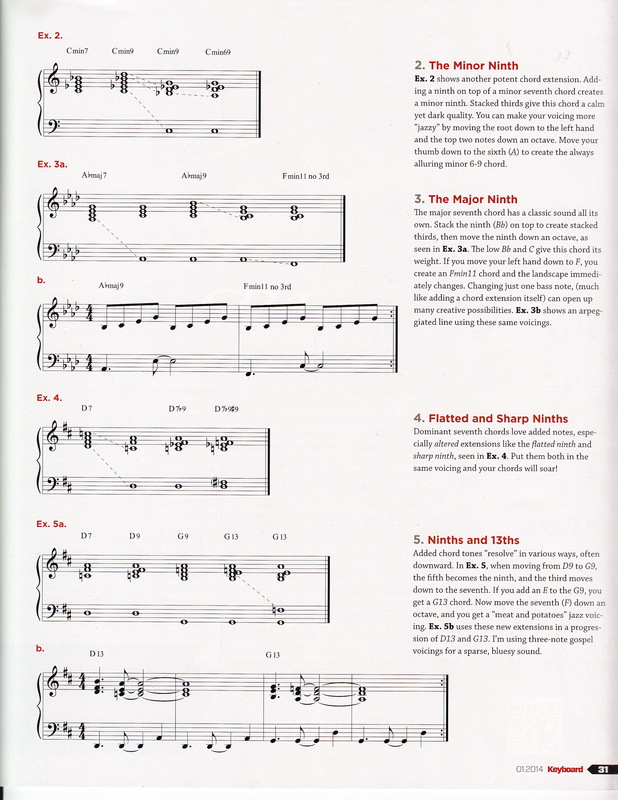 Experiment with spreading out your voicing—here the fourth intervals impart a modern sound. We construct the sharp five by moving the major triad’s fifth up a half-step, as in Ex. 7a. This creates a most unstable sounding chord. Move the root down to the seventh with your thumb and then resolve it all to a C9 chord. Ex. 7b shows how there’s also a place for the sharp five in major seventh and ninth chords, taking you into a spooky, dissonant space. The progression in Ex. 8 moves one or two notes at a time from the I chord (C) to the IV chord (F) and back using the chromatic motion of sevenths and extensions. Ex. 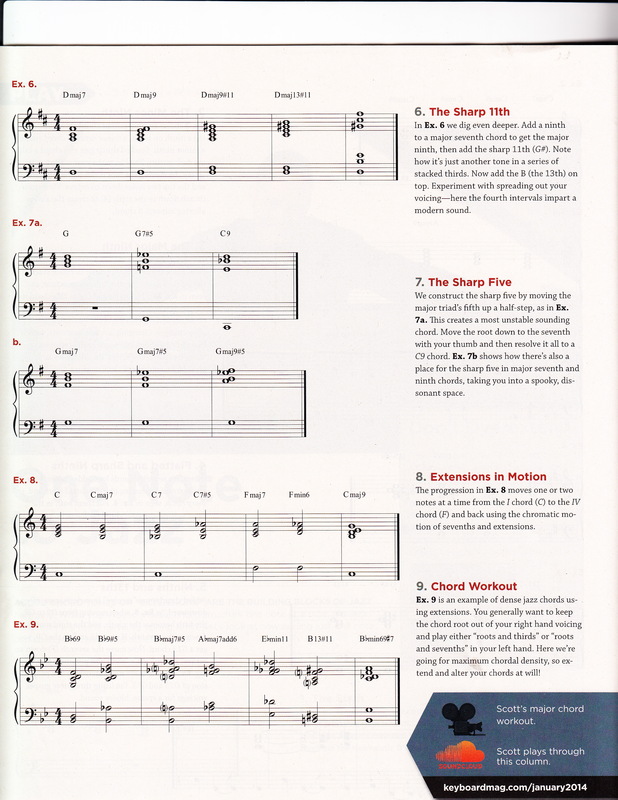 9 is an example of dense jazz chords using extensions. You generally want to keep the chord root out of your right hand voicing and play either “roots and thirds” or “roots and sevenths” in your left hand. Here we’re going for maximum chordal density, so extend and alter your chords at will! 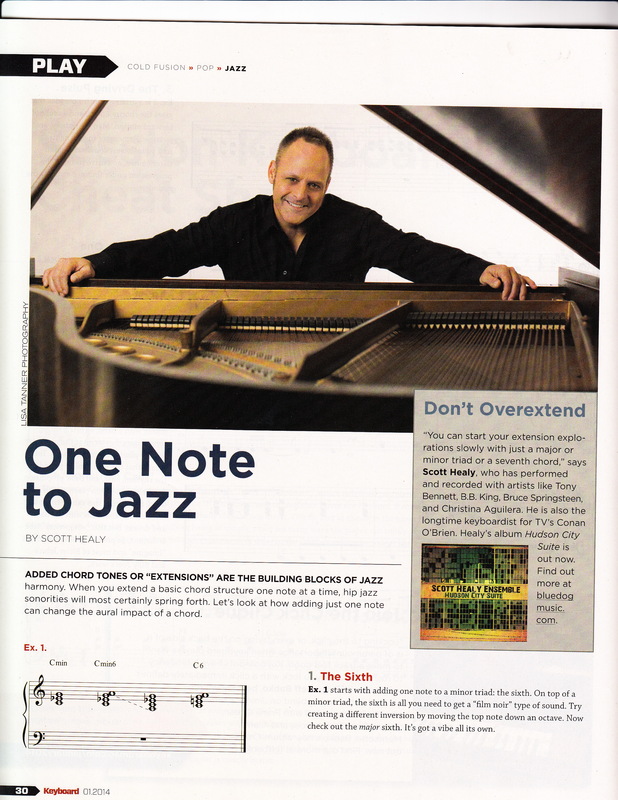 “You can start your extension explorations slowly with just a major or minor triad or a seventh chord,” says Scott Healy, who has performed and recorded with artists like Tony Bennett, B.B. King, Bruce Springsteen, and Christina Aguilera. He is also the longtime keyboardist for TV’s Conan O’Brien. At press time in December 2013, the track “Koko on the Boulevard,” from Healy’s album Hudson City Suite, had been nominated for a Grammy(TM) award for Best Instrumental Composition. Find out more about Scott at bluedogmusic.com.